He is the first among idols. 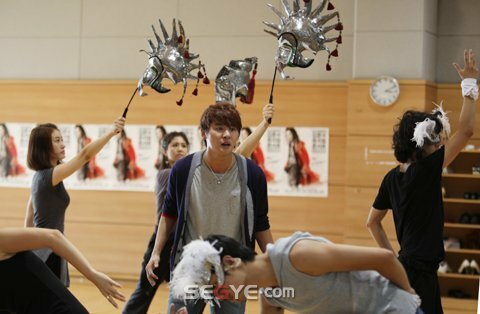 Xiah Junsu (Kim Junsu), who is preparing for a musical concert that has his name on it, is hard at work as usual. The ‘Kim Junsu Musical Concert’, which will be performed across a span of four days starting from the 7th, is a concert that has Xiah Junsu’s name in its title though it will include musical stars such as Seo Beom Seok, Min Young Gi, Bae Hae Sun and Shin Young Suk. The reason that such a concert is able to be planned and prepared is none other than Xiah Junsu’s ticket power. 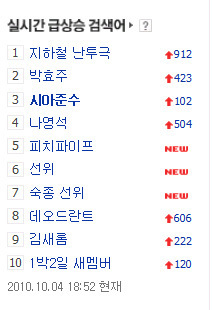 Ever since first generation idols Ok Joo Hyun from Fin.K.L. and Choi Sung Hee (Bada) from SES successfully launched their musical careers with outstanding talent and ticket power, the number of idols taking their chance at musicals has greatly increased. The one who is receiving the greatest attention is Xiah Junsu. 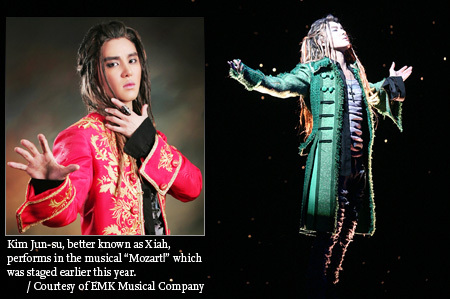 It was known that Xiah Junsu, who won the Best Male Newcomer Award and Popularity Award at ‘The Musical Awards’ following his appearance in the musical ‘Mozart!’, strictly ruled out all other activities when he began rehearsing for the musical so that he could concentrate fully on his role. Reviews stated that he was able to understand and merge with his character at an extraordinary level for the theme of the piece was ‘Musician’. We recently met with Xiah Junsu during one of his rehearsals at the Choongmoo Art Hall in Seoul. A few minutes into the rehearsal, he was already covered in sweat from head to toe. He truthfully admitted that he felt a great deal of pressure from his name being included in the title of the concert but he confidently stated that the performance would be a success. With 10,000 seats per performance, the concert differentiates itself from previous gala concerts starting with its size. According to the staff, preparation for the concert began as soon as the Korean shows of ‘Mozart!’ were completed, and finalized after a conference at Levay’s home in Vienna, Austria in May. Xiah Junsu will be joined by Kim Moon Jung, Music Director for ‘Mamma Mia’ and ‘My Heart’s Reed Organ’, who will be leading a 38 person orchestra, as well as world renowned composer Sylvester Levay and musical actor Uwe Kroeger, who will make his first appearance in Korea through this concert. The highlight of the concert will be Xiah Junsu’s new song. The fact that Xiah Junsu will be showcasing his single ‘Intoxication’ for the first time in Korea is already garnering great interest from fans. The musical ‘Mozart!’ is a piece that forms a dynamic conflict structure from genius musician Mozart’s short but intense life. A musical created by world renowned writer Micahel Kunze and Grammy Award winning composer Sylvester Levay, it began showing in Austria in 1999 and quickly spread to the stages of Germany, Sweden, Japan and Hungary. The piece is filled by Mozart’s longing for love and freedom and the stories of the people around him. Various characters bring the show to life such as Leopold, a twisted father who uses his son to satisfy his own greed, Prince Archbishop Colloredo, Mozart’s patron and rival, and Mozart’s lover Constanze, who embraces and loves Mozart’s genius and humane characteristics. The rotating stage with stairs, added to the mix of classical and rock music and the 500 flamboyant costumes are others sights to see in the musical. Our curiosity about ‘TVXQ’ could not be left out. He rose to the top of Oricon’s daily chart with the album released by the TVXQ unit that is comprised of Micky Yoochun, Xiah Junsu, YoungWoong Jaejoong. When asked if the members frequently contact each other, he gave a simple answer. [Trans] 101004 2D1N’s 6th Member.. PD Na Young Seok Vs Xiah Junsu? PD Na Young Seok has set out to fill in the gap in ’2 Days 1 Night’. At the same time, TVXQ’s Xiah Junsu, who is currently planning new activities as a member of JYJ, is garnering attention for being called ‘The 6th Member’ by netizens. With the growing anticipation for PD Na Young Seok came a rumor that began to circulate that “TVXQ member Xiah Junsu is set to be the sixth member in ’2 Days 1 Night’.” The reason this rumor began was because a picture began to spread of a sleeping Xiah Junsu photoshopped amongst the members of ’2 Days 1 Night’ during their nap. The retouched photo, created by a fan of Xiah Junsu, was so natural that one couldn’t tell the difference between Xiah Junsu and the existing members. Super Junior Eunhyuk revealed his best friend Xiah Junsu’s betrayal. On MBC Chuseok Special episode aired on the 23rd ‘Radio Star – Super Show’ (MC Kim Gook Jin, Yoon Jong Shin, Kim Gu Ra) Eunhyuk said, “I have a determination not to drink alcohol”. Eunhyuk continued, “Until now, I never drink even a drop of alcohol.” arousing everyone’s curiosity. “Junsu and I made promise together not to drink alcohol,” he said, “But Junsu then broke it (the promise).” Eunhyuk complained. Meanwhile, in ‘Radio Star – Super Show’ Super Junior members who made appearances were Lee Teuk, Donghae, Shindong, Eunhyuk, Kyuhyun, Sungmin, and Ryeowook. Kim Jun-su, better known as Xiah, a member of K-pop group TVXQ, will perform with Grammy Award-winning composer Sylvester Levay in the musical concert “Mozart!” at the Olympic Gymnastics Stadium from Oct. 7 to 10. Renowned for composing film scores in Hollywood from 1980 to 2000, Levay wrote his most popular works for the mid-1980s U.S. TV action series “Airwolf” (1984-1986). Since the 1990s, Levay has dedicated himself to musicals. Kim and other actors will team up with the Hungarian composer who will lead a 38-member orchestra to perform the memorable musical. The concert will include songs from “Elizabeth,” also composed by Levay to be performed by Kim, Park Eun-tae and Jeon Dong-seok. “Elizabeth,” a representative Austrian musical collaboration by Levay and his writing partner Michael Kunze, will be presented in Korea in 2012. Also, Kim will introduce a new song composed by Levay, who was deeply impressed by Kim’s performances both in the musical and as a member of TVXQ. When Kim first took the role, there was a lot of cynicism and doubt about his debut as a musical actor but he rebuffed such criticism with his powerful vocals and excellent performances. The EMK Musical Company said that in the concert, Kim is expected to show his talent as a musical actor that goes beyond his popularity as a K-pop idol star. 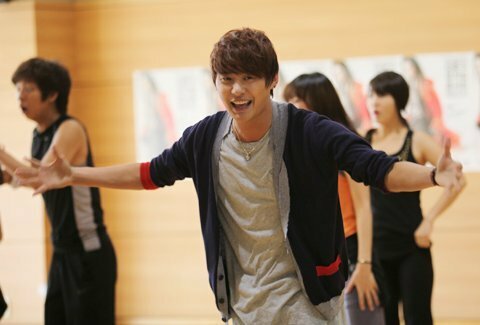 Kim recently took part in singing the title song for the drama “Sungkyunkwan Scandal,” along with Micky and Hero. Veteran actor Seo Beom-seok who played Mozart’s father in the musical said that it will be a good opportunity for him and his fans alike to enjoy the program once again. “All actors who took part in the premiere earlier this year have missed Levay’s music. So we are very excited to hold a concert with him on this special occasion,” he said. Yu Hee-sung, co-director of the musical, said that Kim and world-renowned musician Levay will produce a concert different from other gala events. “All the staff and the actors are making a concerted effort to recreate a touching performance for some 40,000 people,” he said. The local musical production company said that it will put “Mozart!”on stage as an encore performance next year and “Elizabeth” in 2012.